Outdoor Cooling in hot climate cities like Dubai and Abu Dhabi is a very hard mission to be achieved, and with that almost impossible to be done with traditional air conditioners. 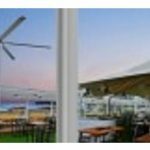 So here evaporative outdoor AC’s are efficient, eco-friendly and cost-effective choice. Rental service available within Dubai, Abu Dhabi & other northern emirates. 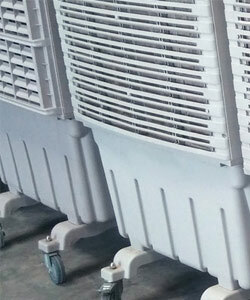 For temporary and backup cooling, or for spot cooling applications like production line or data center cooling. These portable air conditioner units are very durable and comes handy for events & tent cooling which is very common in Dubai & UAE. At “Outdoor AC Dubai” We provide special & outdoor cooling solutions that suits UAE’s harsh climate. Given it’s your patio, workshop, warehouse or restaurant, We offer Free consultation to help you select the best solution. Since current AC designed to circulate and re-cool the same air, in outdoor AC case there is no way to circulate the same air. So need 100% fresh air supply all the time, and the Air conditioner must handle high Delta temperature. 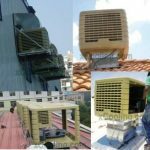 The other thing is necessary in outdoor cooling is the amount if air, since outdoor cooling needs 5 to 10 times more air with high velocity. The first option for outdoor cooling is using portable AC and spot air conditioners. This particular type of industrial portable air conditioners designed to work in harsh conditions and can handle high temperature with no air circulation. Air Coolers using water evaporation for cooling, similar. This evaporation process lowers the temperature. Evaporation of water consumes latent heat that taken from the air causing lower temperature of the air. When dry air enters into an Air Cooler, throw this air throws the wet evaporative pad Cooling Media where it evaporates faster with the large surface. Then the cold air sucked by a powerful fan. An evaporative air cooler works best in outdoor spaces and open areas. 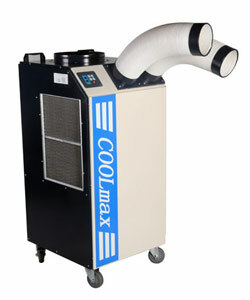 The massive high-pressure amount of air produced by the cooler will increase the people comfort level. 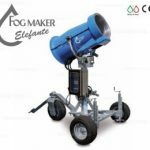 And can help people to enjoy outdoor events and parties.